Yes, I know there are nine photographs but I couldn't not put all of these photographs in this post. My week has been filled with coffee, rain, coffee, rain, magazines, Costco cookies (aka. heaven), magazine freebie hunting and new make up launches! Firstly, this Topshop mug - the one that looks like a toadstool mushroom...it is adorable! I bought it from Topshop a month or so ago and I love it; the lid can be used to cover the mug or as a coaster. Although the mug is fairly heavy and priced at £9 it is not the cheapest but it is so cute. I have been drinking quite a lot of coffee this week so while in ASDA the other day I saw some latte glasses (top left) and I love them! They look great, in my opinion but they do only just hold 250ml; although they were only £2. Another thing I have been loving this week is the tidal wave of new make up launches! Revlon have released their new kissable balm stains this week (they are now available in boots for £7.99 and Superdrug for £5.99, which is an introductory offer). Revlon have also recently launched their 'PhotoReady' range which includes: a pressed powder, concealer, primer, foundation and blushes. I bought the Revlon PhotoReady concealer stick and I really like it so far. Although on my dry skin it can look a little bit cakey. Also Revlon have released their colorstay eyeshadow quads and I have a quad called 'addiction' and I am not that impressed with it - review coming soon. Bourjois have launched their spring/summer collection recently which included new nail polishes, the colorissimo lip palette and the Quintet eyeshadow palette. I have one of the 1 second new nail polishes (the shades are new and the formula is now a gel) and the shade I have is 'beige distinction' which is divine! I love the Bourjois 1 second polishes as they are incredibly easy to use and they dry fairly quickly, although the longevity is not amazing. Avon have released a couple of new items recently including the Chromes eyeliners; I have one in the shade 'Mocha Flash' - link here to my review/swatches. Real techniques have three new brushes out; the fine liner brush, the setting brush and the expert face brush - I have the expert face brush and I adore it! ELF (eyeslipsface) have a couple of new products out too; one of which is the primer eye shadows and I have one in the shade 'Coco Loco' and I really don't like it - review coming soon! And most recently YSL have released their new Touche Eclat foundation! I have a sample of it from a recent Feel Unique order (code: ILOVEYSL) and I will have an initial impressions post shortly. phew. I have been loving the freebies in magazine recently! Glamour magazine, Harper's Bazaar, Elle, Instyle, Red and Marie Claire have freebies in this month. I bought a few and I was a bit disappointed with Instyle as they show that the freebies are the Armani eyes to kill mascara and the Shiseido cleanser but you have to take the magazine to a counter to get the freebies! Then the biggest feature of the week: rain! In England it rains a lot (well in Manchester it does) but this week it has been almost non stop rain which has caused major flooding all over the country. I cannot wait for my holiday in August! 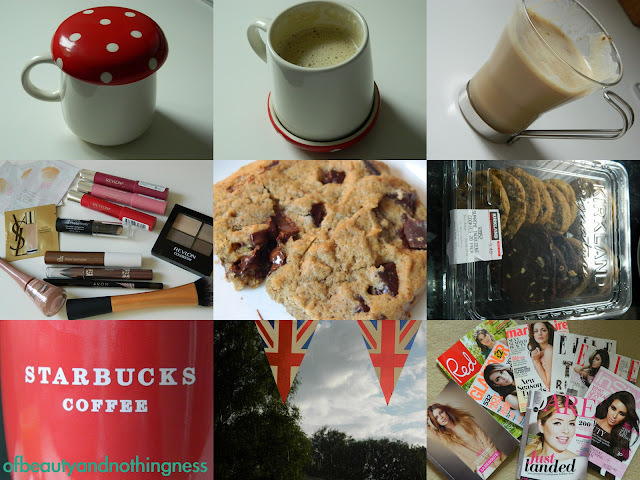 Labels: avon chrome, bourjois polish, Lifestyle, magazine freebies august 2012, real techniques expert face brush, revlon colorstay, revlon kissable stain uk, starbucks mug, Topshop mushroom mug, ysl touche eclat foundation. Categories: avon chrome, bourjois polish, Lifestyle, magazine freebies august 2012, real techniques expert face brush, revlon colorstay, revlon kissable stain uk, starbucks mug, Topshop mushroom mug, ysl touche eclat foundation.